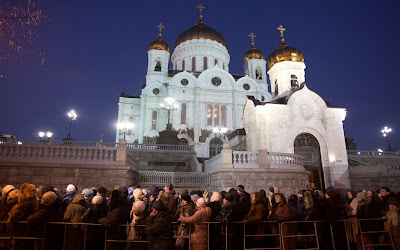 Russian Orthodox believers stand in line to kiss an Orthodox relic, the Belt of the Virgin Mary from the Vatopedi Monastery on Mount Athos, at Christ the Savior Cathedral, in the background, in Moscow, Wednesday, Nov. 23, 2011. King Henry VIII was 6’4” tall, although height did not give him moral stature, nor did he grow in moral greatness as he increased from the 180-pound weight of his youth to the 320 pounds he took to the grave. His marital history is summed up in the schoolboy’s rhyme: “divorced, beheaded, died, divorced, beheaded, survived.” Actually, two of his wives survived him: Anne of Cleves and Catherine Parr. Though he did not set the standard for domestic bliss, he did set some standards for measurements. He proclaimed that the yard unit be the distance from his nose to the tip of his hand and that a foot be the size of his own foot. The noble French, by nature rational, introduced a precise metric system in 1791, but also by disposition contrary, they guillotined one of its inventors, Antoine Lavoisier. The Office of Weights and Measures is unique in Washington, D.C. for its reliability. But in moral matters, the standards in our society are chaotic and even delusional. It was one thing for a king to decree a physical standard by the length of his arm; it is another thing for a state legislature to decree that a husband may have a husband. The human soul’s free will may choose between right and wrong, but it cannot declare wrong to be right. Protagoras of Thrace proposed that “man is the measure of all things.” A few centuries later, Paul of Tarsus proclaimed that the moral standard must be “the measure of the stature of the fullness of Christ” (Ephesians 4:13). Lavoisier said of the metric system “Never has anything more grand and simple, more coherent in all its parts, issued from the hand of man.” But the hand of man can only measure the hand of man. Only Christ can measure the life of man. “Judge not, that you be not judged. For with the judgment you pronounce you will be judged, and the measure you give will be the measure you get” (Matthew 7:1-2). Fortunately Henry's foot had 12 inches(rather than 10), thus being divisible in halves, thirds, fourths, and sixths.